The internationally acclaimed interdisciplinary journal of the Irish American Cultural Institute, Éire-Ireland is the leading forum in the flourishing field of Irish Studies. 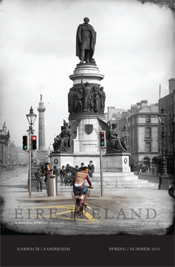 Since 1966, Éire-Ireland has published a wide range of imaginative work and scholarly articles from all areas of the arts, humanities, and social sciences relating to Ireland and Irish America. SUBSCRIPTIONS: The 2010 institutional subscription rate for Éire-Ireland is $100, plus shipping and handling ($5 within the US and $20 for international destinations). A one-year subscription includes two double issues. Please note: The IACI does not offer refunds on subscriptions. Please email Eire-Ireland with any questions. To view Index Issue - Volumes I-XXXIV, click here. To order back issues, click here. NOTE: Please include physical mailing address and biographical notes when submitting. This informative e-newsletter offers members insights into Irish culture, history, and the latest happenings at the IACI. Besides providing updates on IACI programming, this publication offers feature articles, educational information, book reviews, and a wealth of other information. It's Irish American culture, delivered straight to your e-mail inbox! Click here to learn more. Submissions: We are seeking contributions including: recipes, material for children/teen section, listings of local events, book/play/music reviews, useful websites, and short stories. The E-News is distributed to IACI members and donors. Click here to e-mail submissions. Should you wish to be added to our E-News list, please click here. Please be sure to include your name and mailing address.